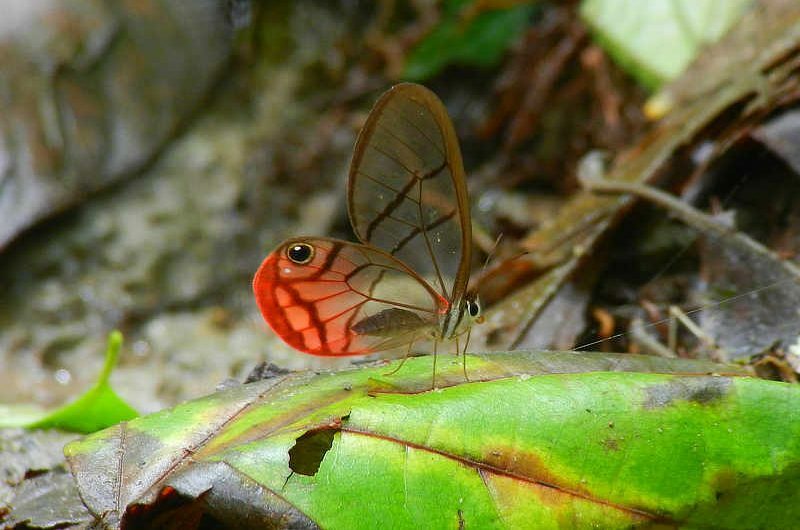 Also known as “Pink-tipped Satyr” and “Blushing Phantom”, this pretty, delicate butterfly is a member of the Nymphalidae family, the brushfoots. It is one of the many striking, beautiful butterflies of tropical America, ranging from Guatemala, throughout Central America and into South America. Its clear wings lack scales, revealing the transparent wing membranes, highlighted with iridescent bright pink on the hindwings and an ocellus or “false eye”. It rests with its wings folded, raising its hind wings perhaps to resemble a small snake, deterring lizards or birds from eating it. This solitary, crepuscular butterfly flies primarily at dawn and dusk, close to the ground in deep, shady rainforest and cloud forest. It has a slow and bounding flight pattern. It rests often on the ground or low vegetation, but is easily disturbed and capable of moving fast to evade predation. Rusted Clearwing-Satyrs feed on rotting palm fruits and fluids from decomposing fungi. In Panama, they are found most commonly in the foothills up to 2000 meters in elevation, and are fairly common around the Canopy Lodge; they can also be seen in the lowland rainforests around the Canopy Tower and Canopy Camp Darien.